Rudresh Mahanthappa is a New York based jazz alto saxophonist and composer. He is a frequent collaborator of pianist Vijay Iyer. 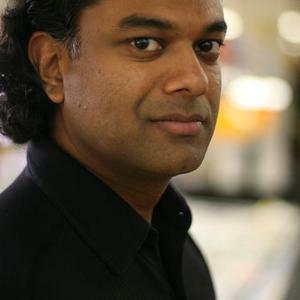 Mahanthappa has been named "Alto Saxophonist of the Year" in the 2011 Down Beat Critics Poll, and also by the Jazz Journalist Association for 3 years running (2009, 2010, 2011). He has been awarded numerous grants for his compositions, including being given the NY Foundation for the Arts Fellow in Music (2006), three Rockefeller MAP grants, and two New York State Council on the Arts grants. Mahanthappa has been named "Alto Saxophonist of the Year" in the 2011 Down Beat Critics Poll, and also by the Jazz Journalist Association for 3 years running (2009, 2010, 2011). He has been awarded numerous grants for his compositions, including being given the NY Foundation for the Arts Fellow in Music (2006), three Rockefeller MAP grants, and two New York State Council on the Arts grants. In 2008, he was named a Guggenheim fellow to pursue his interest in how Indian Carnatic music can inform and serve as an inspiration for American jazz, an honor that belies his unique position in the world of improvised musics. He has five albums out as a leader or co-leader on labels including Pi Recordings and Savoy Jazz. Mahanthappa's playing and composing are firmly ensconced in the highest echelons of the New York jazz scene today. Born in Trieste, Italy, and having grown up in Boulder, CO, Mahanthappa now lives in New York and teaches at the New School University. He leads or co-leads seven projects, including: Rudresh Mahanthappa Quartet (with Vijay Iyer or Craig Taborn on piano, Fran?ois Moutin on bass, and Dan Weiss on drums), Raw Materials (with Vijay Iyer), Indo-Pak Coalition (with Rez Abbasi on sitar-guitar and Dan Weiss on tabla), MSG (with Ronan Guilfoyle on bass and Chander Sardjoe on drums), Dakshina Ensemble septet, and "Dual Identity" with Steve Lehman.